For 400 years and more, the giving of alms by the Weavers' Company was only a minor part of its activity. Initially its benevolence extended largely to ensuring seemly burial for its members, and the gaining of spiritual benefits through common worship and the provision of masses for the dead. In 1550, for example, the sum of only six shillings and eightpence a quarter was paid 'to the poor'. Until about that time, the Church had been the overall provider of alms and lodging for those in distress, in so far as this task had been undertaken at all. However, particularly since the Dissolution of the Monasteries, starting in 1536, Livery Companies have had a tradition of providing Almshouses for the people involved in their craft. The Company’s first Almshouses, funded by a Liveryman, William Watson, were built in Hogsdon (now Hoxton) in the seventeenth century, for retired weavers and the widows of weavers. In the next century Alexander Hosea and Nicholas Garrett, both Liverymen, gave respectively a legacy of property in Holborn and six Almshouses in Porters Fields. By the mid nineteenth century the Porters' Fields Almshouses were in a decayed state and it was decided to consolidate the Almshouses by building on a site at Wanstead, near Epping Forest. Funds were raised by subscription (including 25 guineas from HRH The Prince of Wales) and the building was ready for occupation by 1859. In traditional style, with a central clock tower, the building provided twelve dwellings for men and twelve for women with a large Court Room and accommodation for a superintendent in the central block. By the 1960s there were few working weavers in the London area and the Company considered the future of the Almshouses. A Scheme of the Charity Commission enabled the Company to extend the occupation of the Almshouses to non weavers and, in 1975/76, with the aid of grants, the fine Victorian building, a local landmark, was completely modernised. At the same time a new block of flats, including a Court Room, was built to the rear. This new block was extended in 1988 with the provisions of a lift, six additional flats and an enlarged Court Room, providing a congenial meeting place for residents. 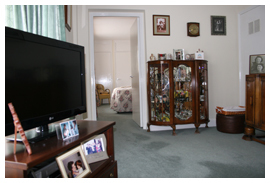 The Company is committed to providing a high standard of accommodation that keeps pace with the changing needs of the elderly, and a further complete modernisation and refurbishment took place between 1998 and 2000, when most of the flats were enlarged: improvements are constantly being made. 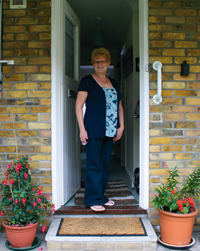 Weavers’ House now provides sheltered accommodation for the elderly in 39 flats and, with resident staff and a central alarm system, offers a safe, comfortable framework within which the residents are encouraged to develop their own community. Assisted by the resident staff, a residents’ social committee arranges coffee mornings, trips and outings and the Company provides an annual summer outing and a Christmas Party. HRH Princess Michael of Kent, an Honorary Freeman of the Company, has taken a particular interest in Weavers' House and its residents over many years, visiting at Christmas and on other special occasions. Installed in the Court Room is a rare stained glass sundial window, saved from the Company’s Hall in Basinghall Street. This, together with another stained glass window from the Hall, depicting the Company’s coat of arms, and other Company artefacts provide a link between the Company's past and the present.